Siberian shaman performed a ritual before the race. 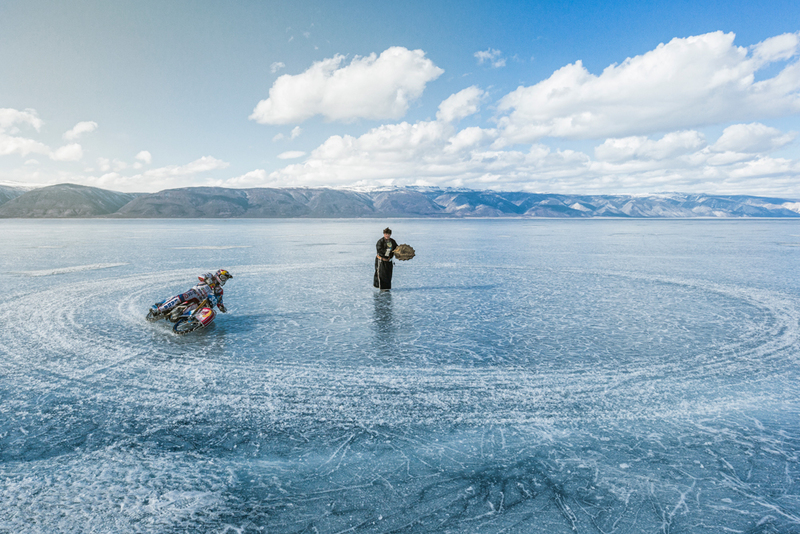 Two-time world ice speedway champion Daniil Ivanov became the first person in the world to ride a speedway bike over Lake Baikal. The Russian motorcycle speedway racer conquered the frozen waters of the world’s deepest lake despite it being spring when the ice in some places is not so secure. This slippery situation obviously took the challenge to a new level. However, the season’s obstacles did not slow Ivanov down, who showed off his skills with various tricks. Before the ride, he participated in a shaman’s ritual, as according to folk beliefs the lake is considered to be a place of force where powerful spirits dwell. "I always wanted to get out of the boundaries of the race track and on to the big ice where there are no fences or protective gates,” Ivanov told the Red Bull official website. “No one has ever tried speedway here and I am so thrilled to be the first." Ivanov, 29, has been ice racing since 2002. In 2013 and 2014 he became the world champion in this type of sport.